This Buffet Tradition model is less than 12 months old and is in great condition. It has been carefully set-up in our Woodwind workshop prior to sale and comes with a 6 month warranty and single case (full details below). It would be ideal as an upgrade/pro model Bb Clarinet it offers a great blend of vintage and contemporary design and tone. The new Tradition has been inspired by a 1960s design while taking into account the needs of modern musical repertoire and performance practice, this brand new cylindrical bore compliments the R13 and RC bore families, adding a new acoustic dimension to the Buffet offerings. These innovations allow the amateur or professional clarinetist to focus on making music, rather than constantly adjusting their embouchure and voicing. 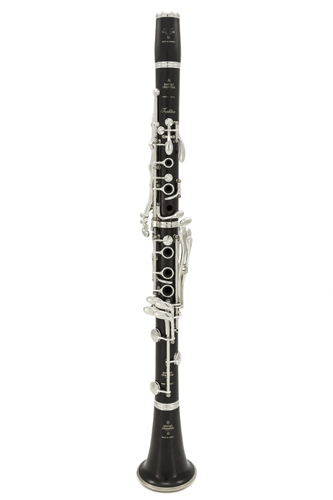 Interestingly the new clarinet also places its roots firmly in research and development from Buffet Crampon’s American and French Artists, this may not seem a huge thing but bear in mind most new Buffet models since 1960 have been developed nearly exclusively with French players only, often who work in the Paris music scene. This more global consulting process is surely a step in the right direction. The American team, consisted of Buffet Crampon Artists: Jonathan Gunn, Burt Hara, Victoria Luperi, Mark Nuccio and Gregory Raden. Whilst the French team was composed of the following Buffet Crampon Artists: Michel Arrignon, Nicolas Baldeyrou and Paul Meyer.